For many, JJ Abrams 2009 'Star Trek' was a revelation - reviving an ailing franchise by appealing to both existing fans and new onlookers alike, with its thrilling drama and comedic touches. A sequel became inevitable, and 'Star Trek Into Darkness' carries forward much of Abrams' impressive style albeit relying too greatly on previous material. Spoiler-free review follows. 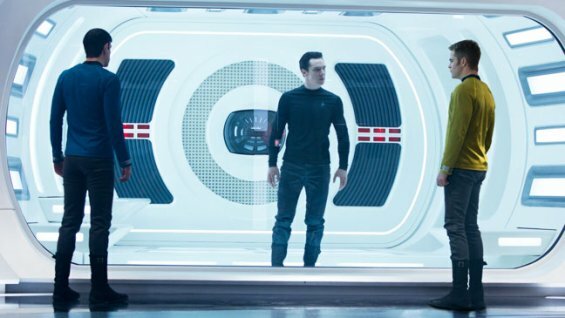 After the completion of a mission, the crew of the USS Enterprise return to Earth to discover that top Starfleet agent John Harrison (Benedict Cumberbatch) has sought to wage a one-man war against the organisation. A devastating attack causes Captain Kirk (Chris Pine) leads the hunt for Harrison, at great cost. Cue turbulent battle scenes and increasingly raised dramatic stakes. As most have suspected, Harrison is not who he seems, and while I don't intend to spoil the true nature of his character, Cumberbatch delivers a chilling performance. Indeed, credit must go to writers Roberto Orci, Alex Kurtzman and Damon Lindelof here for penning a supervillain that is as powerful as any to have appeared on the big screen. Elsewhere, however, they disappoint - particularly in their recycling of plotlines taken from a previous 'Star Trek' incarnation. While Abrams' action-heavy style is often the most acclaimed aspect of his week, I would suggest that Abrams' forté has become the emotional drive he brings to his films. 'Star Trek Into Darkness' is no different with its heartfelt emotional investment, although its final gambit will feel cheapened to any reasonably well-versed 'Star Trek' fan. Although it hardly compares to a somewhat embarrassing "phone a friend" cameo, which suggests that 'Who Wants To Be A Millionaire' is still going strong well into the 23rd century. The returning supporting cast all have their shining moments, with Spock (Zachary Quinto) particularly stepping up - the 2009 'Star Trek' may have been Kirk's story but in many respects, this film is Spock's. But other characters also get franchise-defining screen-time, such as Scotty's (Simon Pegg) steadfast morals and Sulu's (John Cho) steely determination. Peter Weller's turn as Admiral Marcus is perhaps the weakest link, less RoboCop and more "roboflop" here as he ventures almost into pantomime at times. Academy Award-winning composer Michael Giacchino also returns, providing another terrific score that underlines the emotional scenes while adding tension to the conflict. 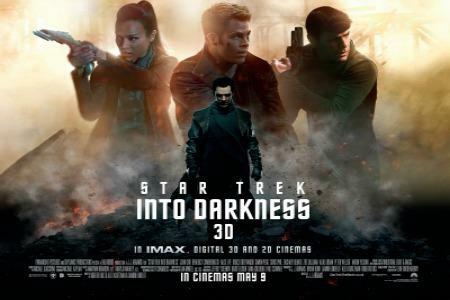 Unfortunately, the sense of rehashing undermines 'Star Trek Into Darkness' in its finale but nonetheless, this is an impressive spectacle that draws you in with its characters as much as its action. The new 'Star Wars' film is in good hands, with Abrams at its helm. 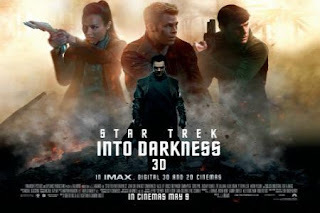 'Star Trek Into Darkness' opened in UK cinemas on 9 May '13.